It was a warm summer morning sometime in May 2008. I had just purchased my Canon EOS 40D camera and a telephoto lens. 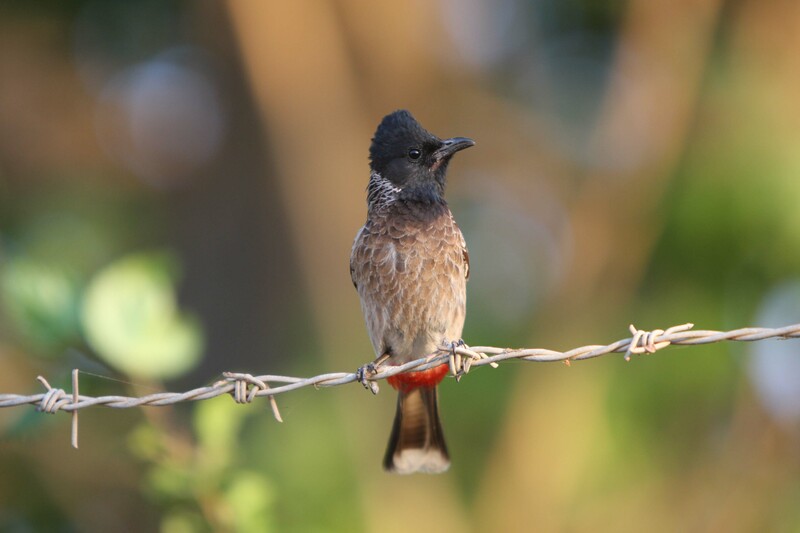 Gir seemed to be a perfect photo expedition to get some interesting shots. Our gypsy entered the jungle around daybreak and we were lucky enough to see some fresh pugmarks on the way. We could follow them for almost a Kilometer and then we heard a monkey call just a few hundred yards ahead of us. It was a dream start to my journey. I saw a young lioness walking along the road imprinting her soft paws on the sand and stalking a group of spotted deers. But I think the sound of our vehicle had already disturbed the deers and they escaped in hurry! I was feeling sorry for spoiling her chances of getting a kill. 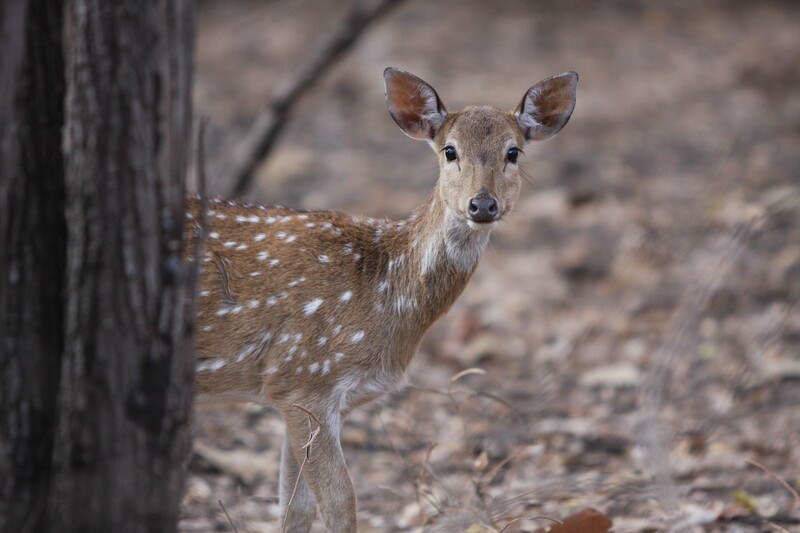 Interestingly I saw a chital (spotted deer) peeping out at us very close behind our gypsy. She was curiously observing us, perhaps elated that her friends were now safe. 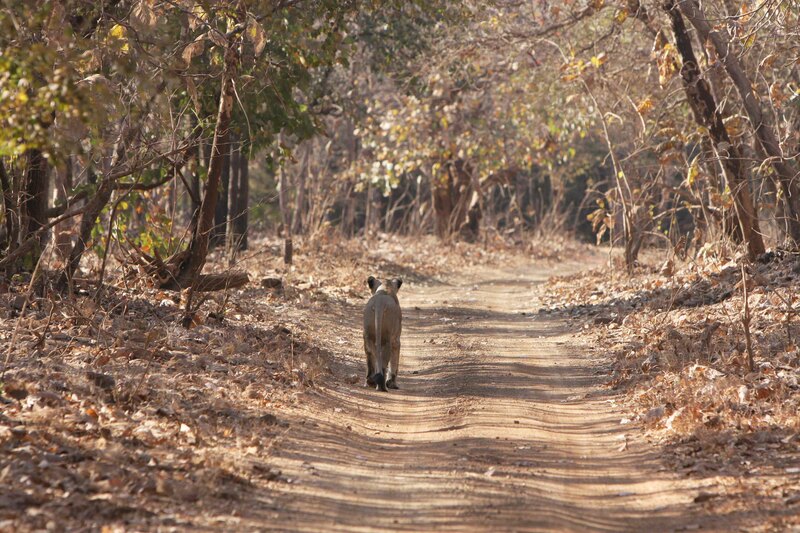 As we followed the lioness we realized that a forest guard passing by on a bike had perhaps spoilt her chances even further. It was the first time I was seeing a big hunter from close quarters observing a human being calmly. Usually all of us have a very stereotypical image of a ever hungry and ready to pounce lion or tiger. She was just looking at the guard and kept a safe distance. “Lions do not attack human beings. If they attack to save themselves they usually tend to give a warning. If the lion is not hungry it will not hunt. Only we humans kill for fun or keep saving and craving for more even when our stomachs are full”, my guide exclaimed. A bit far on my right I sensed some movement. There was a huge animal moving inside branches. We could not clearly spot what it was. But the movement became loud and fast. The lioness kept staring at the shrub. 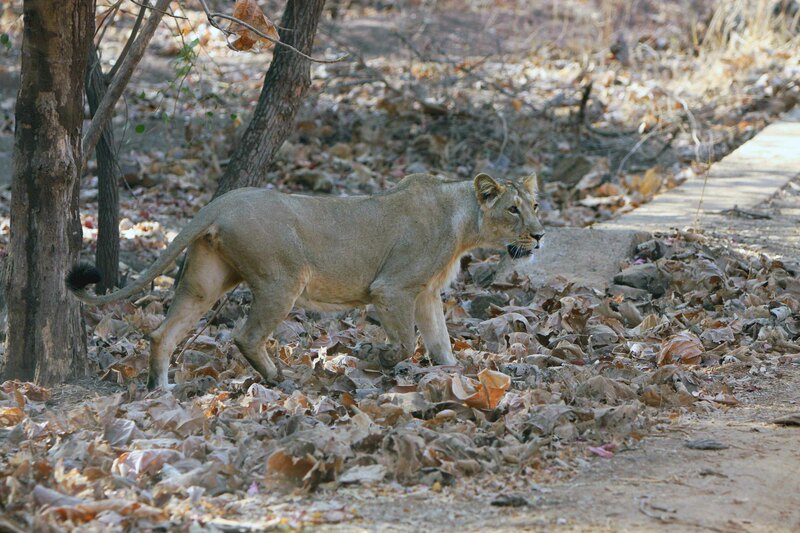 We could hear a sambar call warning the jungle of the lioness’s presence. 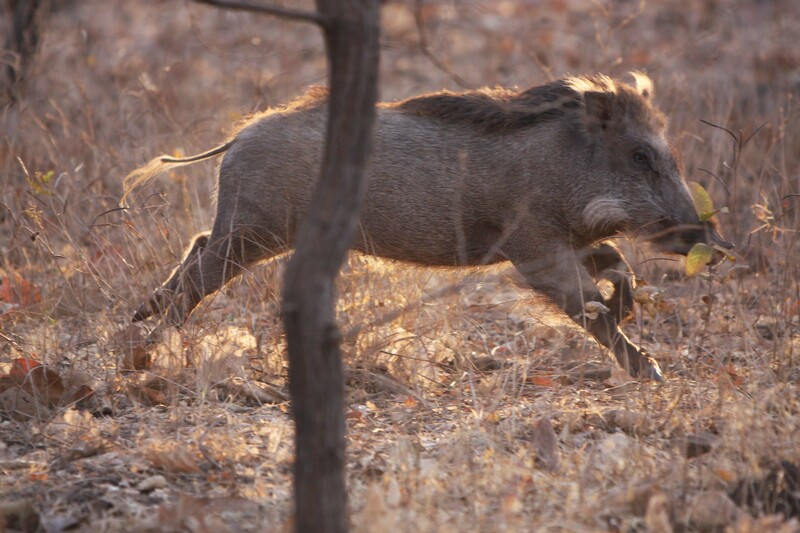 I saw a large wild boar running across on my right. 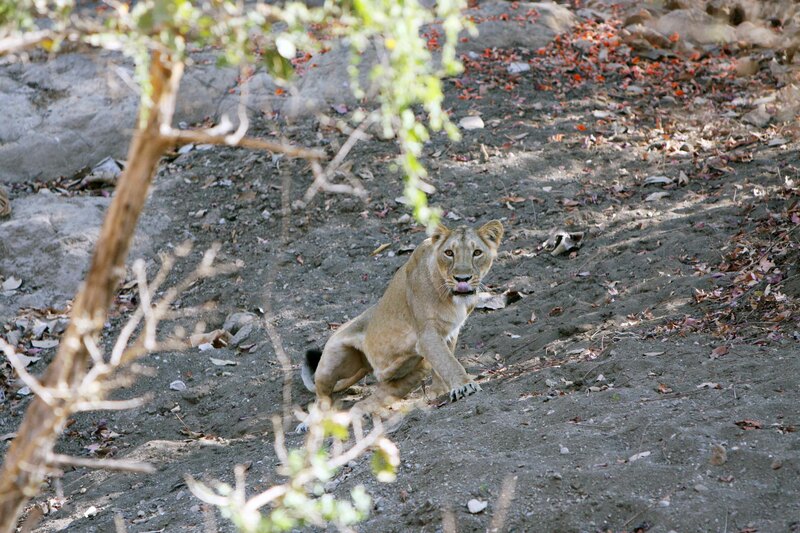 It was perhaps a second chance missed for this lioness. It was my first safari in this jungle and it turned out to be a great experience. I had just met a gorgeous asiatic lioness for more than good 20 minutes and saw her behaviour from not more than 20 feet. I think we worry to much about whether we will see a lion or a tiger when we go in. It is important to soak in the atmosphere. Fill yourself with smells and sounds. Jungle keeps talking to us.